The USA FDA defines the Transport Incubator (Neonatal Incubator) as "a device with an enclosure intended to contain a baby and having transparent section(s) which allow(s) for viewing of the baby, and provided with means to control the environment of the baby primarily by heated air within the enclosure". GPC Medical Limited, well known manufacturers and exporters of quality products, offer a variety of Transport Incubators including the ones made of stainless steel, collapsible and fixed on four castors. The front, head and side doors provide a quick and easy access to the infant. 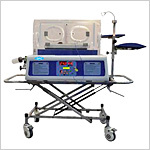 Send Your Buy Requirement For "Transport Incubator" AND Get Quote Quickly.